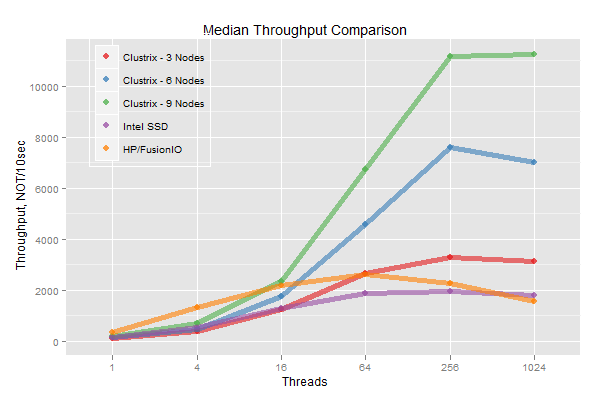 Interesting that at high concurrency 7 Intel 320 perform pretty much the same as FusionIO. 7 320 cost about $2K. How much does that FuisonIO cost – around $10K? When you RAID-0 7 SSD, did SATA become the bottleneck? Is there a HW specification available also of the Clustrix systems as well? The Clustrix node is mostly off the shelf hardware with a couple extra components in it. It has 7 Intel 320 drives, 48GB RAM, dual 4 core Westmere processors. The extra components are Infiniband for inter-node communication and an NVRAM for very low latency writes with guaranteed durability. The hardware is important, of course, but the real magic is in the Clustrix software. The software is what allows it to seamlessly scale a single database to span multiple nodes. on high concurrency in MySQL what really comes into play is internal locking, and under-laying hardware has less effect. I did not look what is bottleneck with 7 Intel 320 SSD drives, as main focus there was on Clustrix systems. However it is worth to mention that it was software RAID0, not hardware RAID. How this compares to Galara replication? I am going to write detailed blog post about Custrix, in short it is very different from Galera replication. Galera is based on MySQL/InnoDB, OpenSource, where each node contains full copy of data. Clustrix is proprietary software which uses only MySQL protocol and internally it is absolutely different solution. Clustrix does not keep full copy of data on each node, only partial and it automatically re-balances load and data distribution. Oh, thanks for insight! On quickview they looked very similar to me. Looking forward for detailed article. Very interesting performance numbers. Can anyone comment on the stability of Clusterix overall today? I am basing this on second-hand knowledge from colleagues who tested it, but my understanding was it still has many bugs to iron out. In the end we chose not to use it due to bugs. This was done about a year ago, however. If you have questions and I’d be happy to talk about our experience with Clustrix. I came across this post because I would like to learn more about Clustrix. The comparison of Clustrix to MySQL is very interesting but I have doubts regarding one detail of your testing methodology. You used 4 clients to test Clustrix and you used only 1 client to test MySQL. Why ? This is very strange since I think that actually the client got saturated in the MySQL case, not the MySQL server. Or maybe I am wrong and there was a reason to use 4 clients to test Clustrix and only 1 client to test MySQL ? Could you please give an evidence that it was really the server that was saturated in the MySQL test and that the client was NOT saturated ? Hello and thanks for detailed comparison. Can you provide TPC-C repository source to repeat your benchmark?